According to a study by Research and Markets, the hearables market, a wearables sub-segment that includes hearing aids, personal sound amplifiers (PSAPs) and earbuds/headphones, had an estimated value of $130 million in 2015 and is slated for a compound annual growth rate (CAGR) of >120% to be worth $7.6 billion by 2020. And while advancements, such as wireless capability, are improving hearables functionality in both the medical device and leisure spaces, the batteries designed to power hearables are a weak point in the technology that must be addressed for the industry to truly thrive. Choosing the right battery for the job is important for product size, run time, safety, longevity and sustainability and, until very recently, the options were few and far between. The immediate need for long-lasting rechargeable power is being met by only a couple of truly practical and reliable options—namely lithium-ion and silver-zinc. Lithium-ion is a well-known and oft-used rechargeable standard, while silver-zinc is a relative newcomer, though the chemistry has been around for decades. These two chemistries are currently competing for real estate in the hearables sector. While each can deliver long-lasting rechargeable power in the microbattery format, silver-zinc is showing itself to be the rechargeable battery of choice for the majority of manufacturers making hearing aids, the most advanced hearables on the market today. Understanding how silver-zinc is being used in the hearing aid space will help developers understand how this technology might power the smallest and safest products of tomorrow. Traditionally, hearing aids have been powered by disposable zinc-air batteries, however the power demands of hearing aids have increased significantly with the introduction of numerous advancements such as wireless streaming, feedback algorithms, and noise management programs. Hours of wear-time per day, along with differences in power consumption across hearing aid types and manufacturers, make it difficult to attain absolutely accurate numbers; but a consumer survey from Hearing Tracker found that size 312 (XR41) disposable zinc-air batteries can provide an average of 75 hours of power when used with limited wireless streaming before needing replacement. This amounts to less than five days of use at 16 hours per day. This frequency of changing disposable batteries is not only a hassle for wearers, but can happen at inopportune times during the day: at meals with friends, business meetings, a dark movie theater. This ‘pain point’ for users has led to increased consumer demand for rechargeable hearing aids. Before the advent, just last year, of rechargeable silver-zinc and lithium-ion microbatteries in hearing aids, manufacturers’ only rechargeable option was limited to nickel-metal hydride button cells. These batteries simply lack the energy to power today’s more sophisticated devices. Now, with lithium-ion and silver-zinc options available in nearly all the top hearing aid brands, hearing aid wearers can enjoy long-lasting power and a heightened sense of confidence in the reliability of their devices, alongside the benefits of wireless streaming. From an engineering standpoint, both rechargeable lithium-ion and silver-zinc chemistries offer the energy needed, which is a primary goal. But, while only a couple of hearing aid manufacturers offer a lithium-ion powered product, nearly every single hearing aid manufacturer in the world offers a silver-zinc powered product. This is because there are some distinct advantages to silver-zinc that make it an ideal choice for both the small medical device and the hearable-wearable categories. The first, and possibly most important, feature of silver-zinc is its energy density. The size XR41 silver-zinc microbattery has more energy than any other battery rechargeable chemistry its size and a higher energy density then similarly sized lithium-ion cells. The microbattery segment is where silver-zinc offers distinct advantages to lithium-ion, particularly as the cells get smaller. Lithium-ion does not lend itself to this miniaturization. Due to the chemistry’s low electrode current density and resulting electrode design, lithium-ion manufacturers struggle to make high energy destiny microbatteries with cell heights below 4mm. The most popular hearing aid battery size, the XR41 battery, has a nominal height of 3.4 mm. The electrode design of the silver-zinc cell allows for much smaller cell sizes without the steep drop in energy density. Safety is always a concern when discussing rechargeable batteries. Silver-zinc rechargeable batteries are made from a water-based chemistry that is non-flammable. Lithium-ion cells however, if misused or poorly constructed, can become unstable. Consequently, lithium-ion based products require extra circuitry to protect users from the dangerous use conditions, forcing designers to increase the product’s size. In the hearable wearable market, silver zinc based microbatteries help enable engineers to make the products as small as possible. Another consideration, especially when designing a product that will be used by children and the elderly, is toxicity and high voltage. Lithium-ion batteries must be sealed in to devices to protect the consumer from accidental ingestion. Silver-zinc is non-toxic and has a lower voltage, which makes it a preferred choice for products designed for children, the elderly and animals. From a sustainability standpoint, sealing in batteries is currently wreaking havoc across the recycling industry in general. A recent Green Biz article, written by the CEO and president of Call2Recycle, Inc., bemoans this recent trend in product design, citing the fact that products with sealed-in batteries are difficult, if not impossible, to disassemble and are contributing to an alarming amount of “tech trash” heading into landfills. With the hearables market slated to grow exponentially over the coming years, if this issue is not confronted and corrected, we’re looking at millions of broken earbuds containing toxic chemicals that will be thrown away with no potential for a second life. Silver-zinc batteries are 100% recyclable. Their chemical elements can be fully recycled, while lithium-ion can only be down cycled. And because there is no need to seal them in, product designers have more freedom to design in a sustainable manner. As the hearables market takes off, developers may want to look to the hearing aid industry for guidance. Manufacturers of hearing aids, the original wearable, are using rechargeable silver–zinc batteries for their most advanced hearing aids. Hearing aids are worn for 15+ hours per day, offer wireless streaming and use extremely sophisticated power management. Conversely, hearables are striving to provide five hours of use. Applying the knowledge of the hearing aid industry to the hearable space may enable smaller designs, more capabilities, longer wear time, and improved safety. 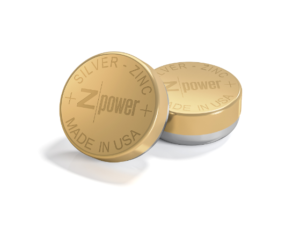 For more information about silver-zinc batteries, visit ZPower.